The theme of the International conference on "Molecular Advances in Biomedical Research" is to share the scientific knowledge among students, scholars, scientists, faculties and industrial persons with the help of experts here. There are number of diseases occur in human being. All diseases can't be solved immediately though many modern techniques available in the field today. Both biological and medical scientists play a good role on human health. A common forum is essentially required to discuss about the recent trends in various fields such as molecular biology, stem cell therapy, medical imaging, cancer biology and neurobiology etc. Hence the conference is under taken to discuss all the problems at international level. This is the main objective of this conference. 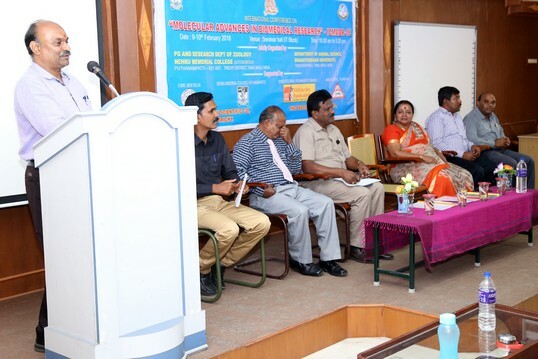 The international conference has been jointly organized by PG & Research Department of Zoology, Nehru Memorial College, Puthanampatti and Department of Animal Science, Bharathidasan University, Tiruchirappalli. Dr. K. Saravanan, Asst. 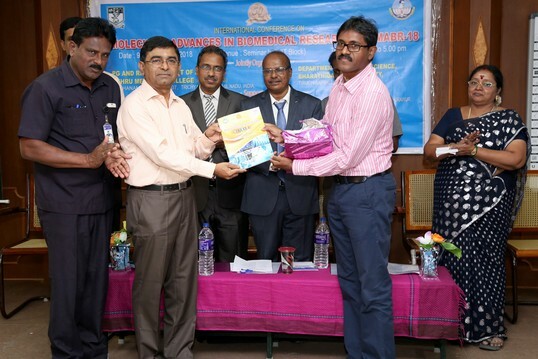 Prof of Zoology, Nehru Memorial College and Dr. G. Archunan, UGC-BSR - Faculty Fellow, Bharathidasan University acted as organizing secretaries of this conference. The conference is financially supported by ICMR (Indian Council of Medical Research). 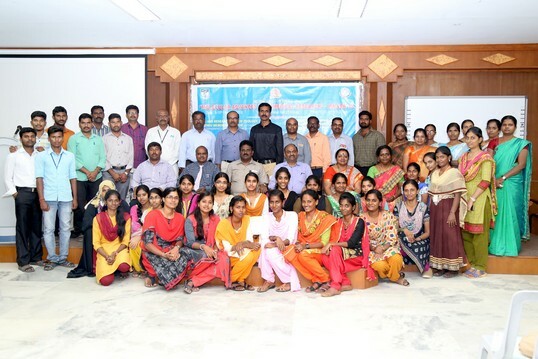 It is also supported by Nehru Memorial College, Syndicate Bank, Puthanampatti Branch, The Precision Scientific Co. Trichy, Varshini Scientific suppliers, Trichy, Annai Hospital, Thuraiyur. Many eminent resource persons spoke on the ways and means for developing the knowledge of biomedical research here. 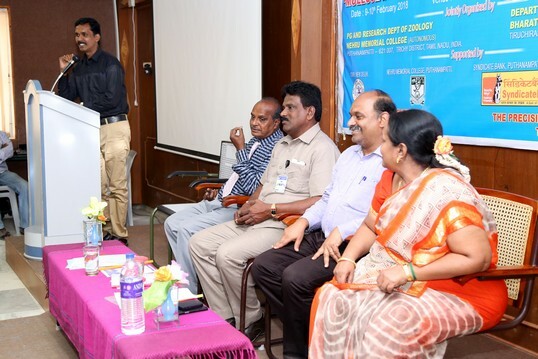 In this conference as many as 36 institutions have given their abstract, of which 9 Universities from Tamilnadu and Pondicherry, 5 foreign universities, 16 arts and science colleges, 6 medical and research centers from different part have given their papers. More papers received from Bharathidasan University, Holy cross college and Nehru Memorial College that is 21 abstracts each respectively. A total of 150 participants have registered for participation and presentation. Carmel college (Kerala), Narayana Nethraleya Foundation, Bangolore, Cauvery college, National college, Jamal Mohamed college, Periyar EVR college, AVC college, Bishop Heber college, Govt arts college Chidambaram, Arignar Anna arts college Musiri, Govt arts college Coimbatore, contributed papers also. Two days international conference on "Molecular advances in biomedical research" started on 9th February 2018, the Friday at Nehru Memorial College premises exactly at 10.30 am. It was started with prayer and then Dr. K. Saravanan one of the organizing secretaries welcomed the gatherings. The lighting of lamp "kuthuvelakku" lit by the college president Er. Pon Balasubramanian. After honoring the chief guest, Dr. G. Archunan one of the organizing secretaries gave introduction about the conference. Dr. A.R. Ponperiasamy, Principal of Nehru Memorial College delivered presidential address. Dr. P. Padmanabhan, Duputy Director, Nanyang Technological University, Singapore delivered inaugural address to the gatherings. Er. Pon Balasubramanian, President of Nehru Memorial College delivered felicitation address. 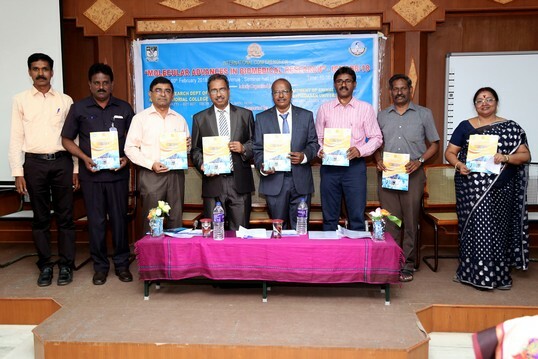 Dr. K. Emmanuvel Rajan Prof and Head, Dept of animal Science, Bharathidasan University released the conference souvenir and abstract book and Er. Pon Balasubramanian, President of Nehru Memorial College received the same. Finally Prof. M.P. Santhi HOD of Zoology, Nehru Memorial College gave the vote of thanks and the inaugural function concluded at 11.45 am. The first technical session was started at 11.45 am. Dr. P. Padmanabhan delivered key note address on "Molecular Imaging". Dr. Debashish Das Chief Scientist, Narayana Nethralaya, Bangalore delivered key note address on "stem cells passing through the baton from basics to clinics". 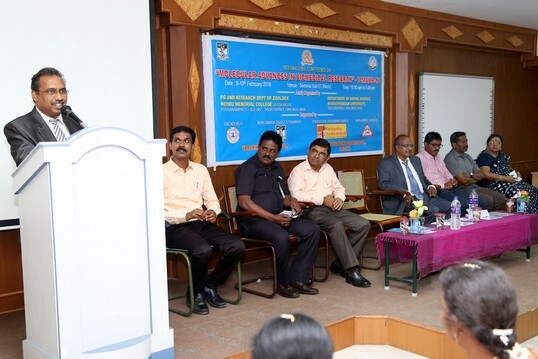 Dr. M. Murugeswari, scientist, Narayana Nethralaya, Bangalore delivered a talk on " Angels of sun (vitaminD3) lights the vision of pre matured babies". As many as 25 Oral presentation was held at the seminar hall. The poster presentation session was held at UG zoology lab. In it 23 institutions exhibited their poster and explained the methods and results to the gatherings of various departments. 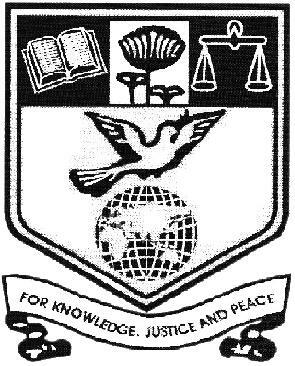 Today programme concluded at 5.30 pm. In the second day Dr. S. Kanagesan, Institute of advanced technology, University of Putra, Malaysia delivered his key note address on "Nanomedicine for cancer treatment". Then Dr. B. Ramalingam, Senior scientist, National Institute for Research in Tuberculosis, Chennai delivered key note address on "Molecular studies of Lupus Nephritis kidneys". Mr. Lenin, Bioscience Clinic Middle East Dubai delivered a key note address on "Recent insights into the basic biology of stem cells and its therapeutic advancement". 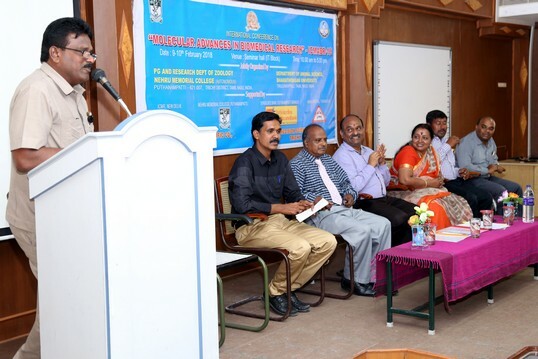 Dr. R. Senthil Kumar, Co-ordinator in Biochemistry, Royalaseema University, Kurnool delivered lecture on "Anti inflammatory effects of non-essential amino acids". The conference was concluded with validatery function. 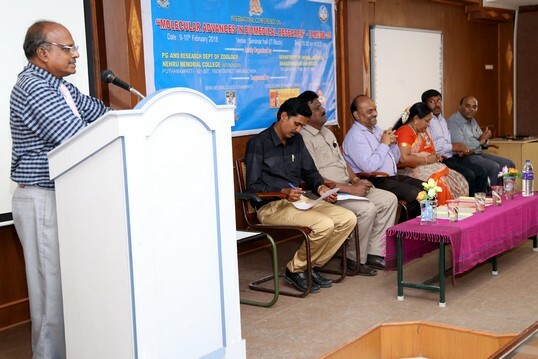 The validatery address was delivered by Dr. R. Nagarajan, Principal, AVC College, Mannampandal. 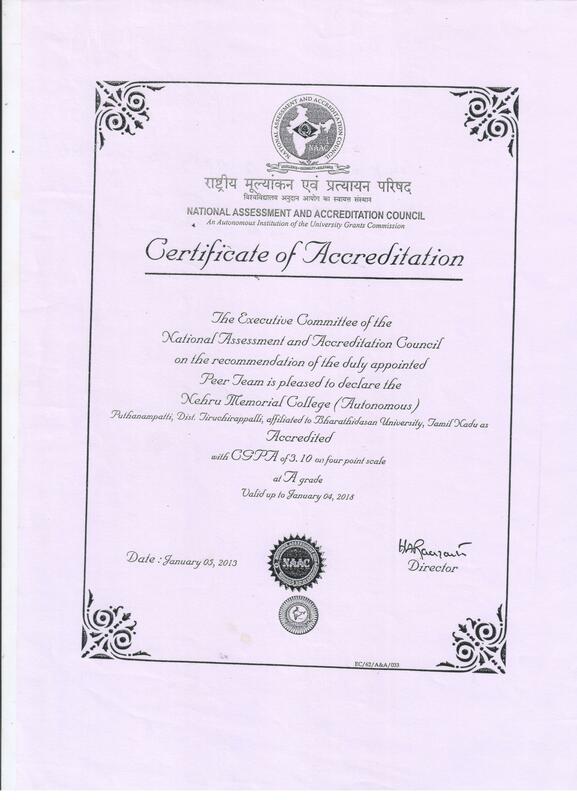 Dr. N. Ramesh, Asst. prof of Zoology, Nehru Memorial College presented the conference report. The certificates and prizes were given to the participants by Er. Pon Balasubramanian, President of Nehru Memorial College. Vote of thanks was given by Dr. K. Saravanan, Asst Prof of Zoology, Nehru Memorial College. The conference was concluded with National anthem.